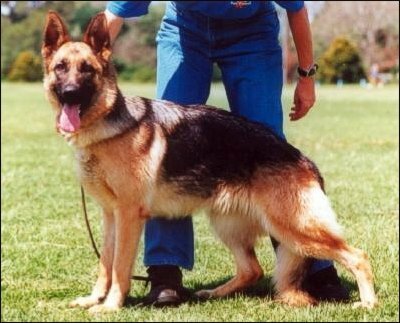 The German Shepherd dogs have a solid bone structure and varieties include short, medium and long haired breeds. A German Shepherds eyes are normally a dark brown colour and shaped similar to an almond. These dogs are highly intelligent and usually have a life span of around fifteen years or so. Being the most popular breed of dog in England and America, the German Shepherd is also commonly known as an Alsatian and was bred originally for herding sheep. Despite the fact that they make extremely loving and loyal family pets, the German Shepherd can also be used as a guide dog for the blind, for various uses in the military and they are often used as police dogs. If trained correctly as puppies, the German Shepherd can grow up to be obedient and great with children making them extremely loyal companions. These dogs need a lot of attention and if treated in a strict but loving manner from being a puppy, a German Shepherd is the ideal choice of dog as a wonderful family pet.